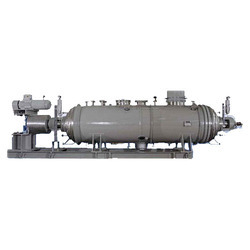 We are the leading supplier of Rotart Paddle Vacuum Dryer. - Energy Consumption is Low due to higher differential temperatures. - Suitable for drying materials which are sensitive to heat, it can maintain low temperatures using high vacuum. - Maximum Solvent Recovery is done. Capacity: 50 Ltrs. to 10,000 Ltrs. ROTARY VACUUM PADDLE DRYER Rotary vacuum dryer offers clean, simple and effective method of drying wet cake, powder and even slurry. • Minimum Labour and Energy Cost. 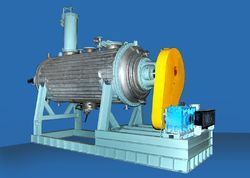 S.S.316 Semi-Automatic Rotary Vacuum Paddle Dryer, Capacity: 8M.SQ.